Every knight needs his trusty steed–even a Dark Knight. 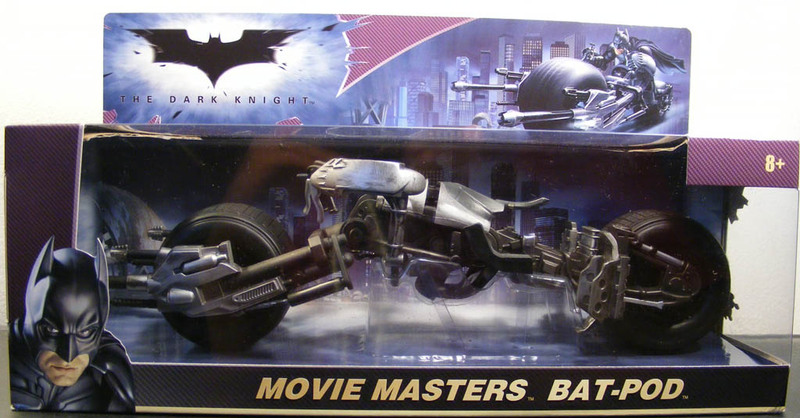 For those who have never visited this site before and have no idea what goes on in the action figure world, the “Movie Masters” are a line of 6″ action figures based on the first two Christopher Nolan Batman films, Batman Begins and The Dark Knight. They differ from the colorful, goofy kids-oriented line in that they’re a bit taller, much better articulated and painted, and have detailed sculpts courtesy of the Four Horsemen. While there are a few different vehicles for the smaller kids’ line, a Tumbler (Batmobile) in the MM scale and quality might be prohibitively expensive (though if Hasbro can get away with the new Millennium Falcon, I can’t imagine an MM Tumbler would be much more costly to produce). However, because Mattel loves us so much, they did manage to give us a Batpod. Despite its inexplicably goofy name, I think the Batpod is a cool addition to Batman’s arsenal. It was designed from scratch for the film with the same eye toward pragmatism and realism as all other aspects of the film. The Batpod comes into play (spoilers ahead) after the Tumbler is struck with a Joker-launched rocket; damaged beyond repair, Batman ejects in the Batpod as the car self-destructs. 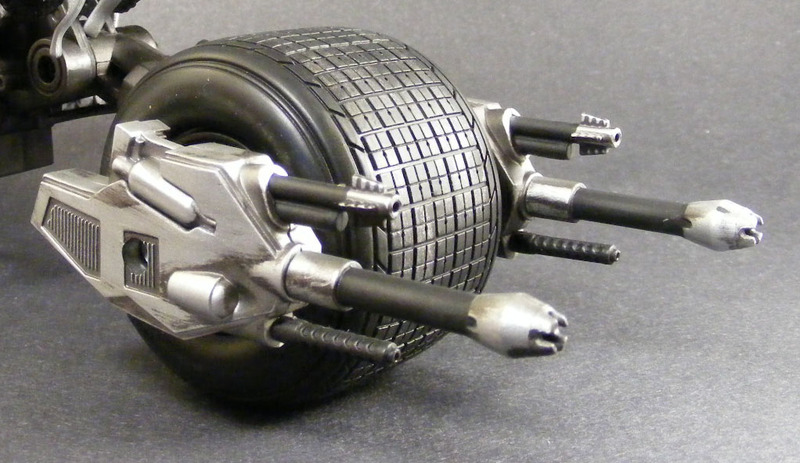 The Tumbler’s front tires are the Batpod’s wheels. While the Batmobile from the first two Burton films will always be my favorite of the ‘mobiles, the Batpod easily wins my favorite Batcycle incarnation. The Movie Masters Batpod is about a foot long from the back tire to the tip of the cannons. Much like the MM figures, the sculpt is good enough for a collector, but playable enough for a kid. Comparing it to production photos of the Batpod from the film, it appears to be fairly accurate. I found a few very minor differences, but this isn’t intended to be a scale model, it’s meant to be a well-made collector’s toy. It’s refreshing to get a vehicle that doesn’t have any ugly weapon-firing action features or come with a pack-in figure of a character I already own. The Batpod does have one added touch, though: the engine cover is hinged and can swing open to reveal the engine. The Batpod is sculpted in hard plastic, but the handlebars are thankfully made from softer material, so when you’re trying to squeeze Batman’s hands around the handles, they won’t break. The tires are made from soft rubber, which is a nice change from the hard plastic tires we so often get on toy vehicles. 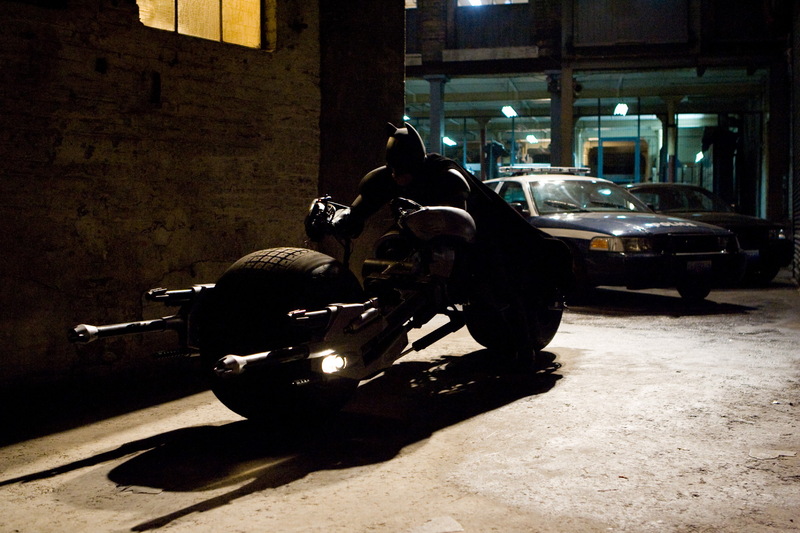 The tires are wide enough that the vehicle stands perfectly on its own whether Batman is sitting on it or not. The paint work is good, but I don’t know that I’d call it outstanding. On the one hand, the Batpod doesn’t exactly need a lot of paint–it’s just silver and black. But the silver-painted parts have a slightly sloppy dry brush that doesn’t quite work. It’s most noticeable around the handlebars. I’m sure there are a few customizers out there who are going to want to repaint the whole thing. The real question, though, is how does the Batman figure look on it? The answer is: not bad, but definitely not perfect. There are a couple problems. 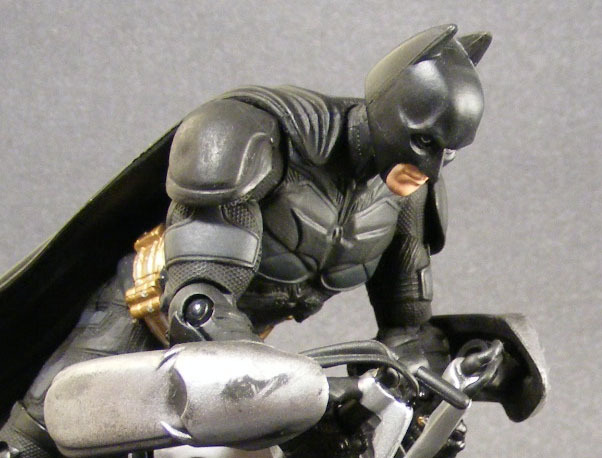 First, the bike appears to be made in a slightly larger scale than the figure, so Batman’s knees and feet don’t line up in their stirrups properly. More problematic, though, is Batman’s upper legs and crotch, which due to their size and shape can’t be positioned properly on the bike. Be aware that you’re going to have to spend ten minutes getting Batman’s hands to fit around the handlebars, and try to be careful doing it. Finally, Batman’s head can’t look quite forward enough, though the angle is arguably accurate to the film depiction. The MM Batpod is availably only at Target and will set you back about $20, which is tad more than I might like to have paid for it, but pretty reasonable given the price of toys these days. It’s exciting to get a vehicle in the Movie Masters line. I recommend you go out and buy it. It’s a great collector’s item and a great toy. And if it sells well, it just might encourage Mattel to make more vehicles–perhaps a Tumbler, or even a new Batmobile for DCUC. Great review – you can get him to fit in on the bike a bit better, if you stretch the arms out more. Push the body all the way back with the arms out straight, no bent elbows, and you can get the feet and knees in the right spot. I do wish the figure's neck joint was a bit more condusive to riding the bike though – you can get him looking forward at the very end of the neck's range of movement, just before his head pops off, but it would be nice if it did that a bit easier. I'm thinking of carving out a bit on the back of the head to allow for it. Thanks MWC! I'll try to get mine to sit better. Do you feel like the bike is just a smidgen too big for DK Batman, though? Either it's scaled a bit larger or he's scaled a bit smaller (I think the latter). Batman Beyond fits on it a bit more nicely, because he's a tad larger. Hmmm – not to my eye. It's a big bike in person, and the DCU seems too large on it, particularly from the waist down. I think the problem is that the figure could stand to be a smidge bigger, but because it can't compact itself like an actual human can, it looks more awkward. Yeah, those are the same reference pics I was using for my review. I dunno…I still think the TDK figure's proportions are a bit undersized for the bike. But it's a near thing, and not particularly bothersome except for the difficulty in getting the figure to sit properly on the back. I'm going to put my Red Hood custom on it… because it looks like something he'd drive. Hrmph… I was at three Targets the other day. While I don't recall seeing it, I wasn't specifically looking for it, my mind was on Transformers… >:-( I did see the Movie Masters 2-Packs at TRU though. Let me know when you see the TRU DCUC two-packs…I'm waiting on that Lightray. I went to go look for It after ur review.found it right away. And it was well worth $20. You weren't kidding when you said we'd spend ten minutes trying to fit Batman's hands around the handlebars. 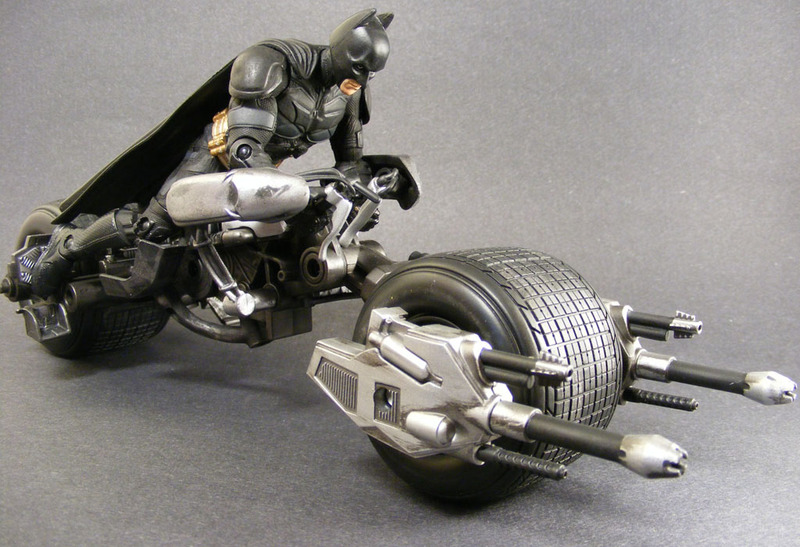 It might be worth it to pick up the Batman Begins MM figure (which I don't have) just so I can have one to ride the bike at all times. Word of caution – the MM BB is even smaller, making it less likely he'll look good (or fit) on the bike. Is there any way to adjust the parts on the bike and make them closer to each other? has anyone tried to sit batman begins batman on that thing??? jeje it might look pretty cool!